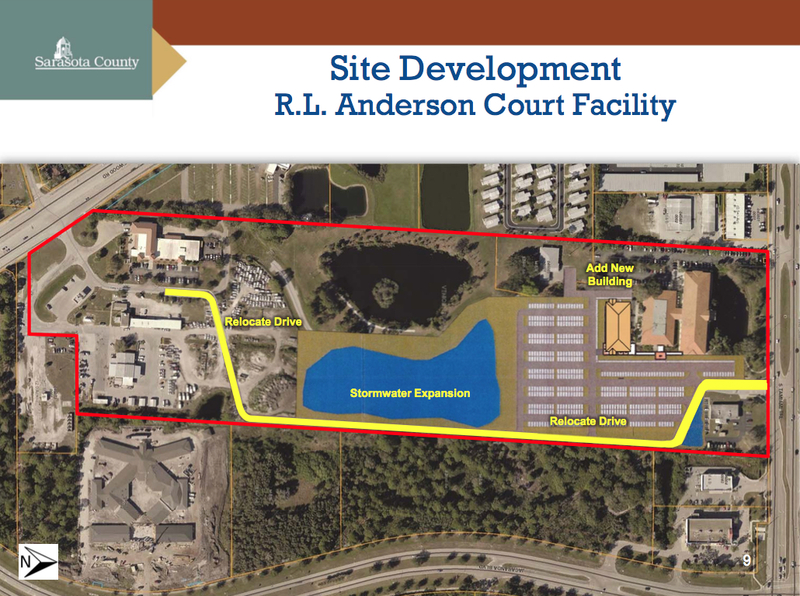 Sarasota County Commissioners Christine Robinson and Charles Hines asked county staff this week to make it “crystal clear,” as Hines put it, that a bond referendum planned for November 2016 will cover a new Public Safety Campus on Cattlemen Road, expansion of the South County court facilities and property where the Sarasota County Sheriff’s Office could place all its fleet maintenance facilities, but not a new jail. The county’s public works director, Isaac Brownman, appeared before the commission during its regular meeting in Venice on Monday, Nov. 9, to seek preliminary approval of the above list of structures for the referendum. That list could be adjusted, Brownman pointed out, as staff continues to search for a site where the county’s fleet maintenance complex could be co-located with that of the Sheriff’s Office. The board voted unanimously to accept the preliminary list. However, as part of his presentation, Brownman noted that the existing jail — located on Ringling Boulevard in downtown Sarasota — has a capacity of 1,026 beds and, since 2014, it has averaged a daily occupancy rate of 91 percent. The industry standard, Brownman said, is about 85 percent, because of the necessity of segregating men from women and juveniles from adults, for example. “I’m really concerned about the way this [discussion] is being framed right now with the jail expansion, because it’s going to rile a lot of people up,” Robinson told him. “The jail expansion is not proposed to be part of the referendum right now,” Brownman responded. “We’ve got to separate all the aspects [of that] from this referendum,” Robinson stressed. Robinson is right, Hines said: “Let’s make sure we’re not talking about other things” in the context of the November 2016 referendum. 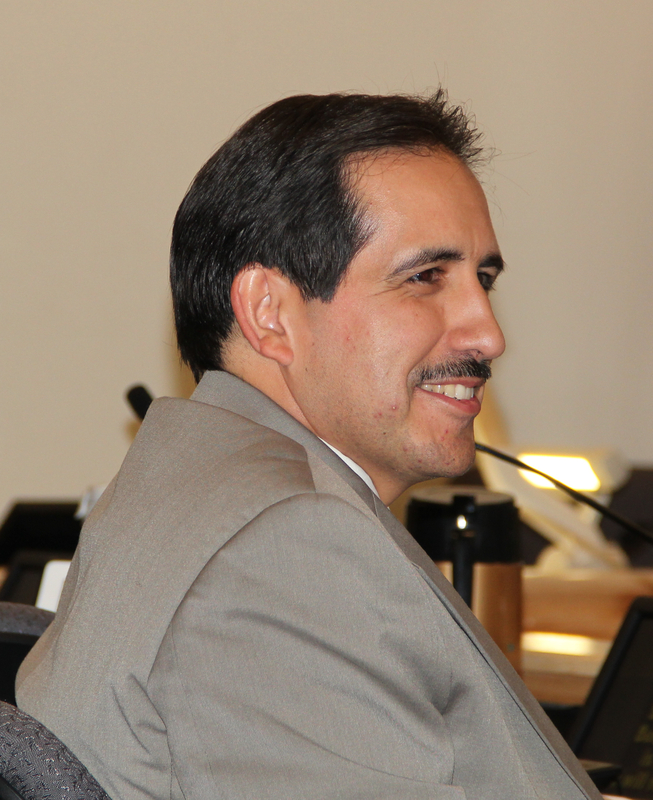 At the outset of the Nov. 9 discussion, Assistant County Administrator Steve Botelho, who is also the county’s chief financial officer, explained that all cost estimates at this point are preliminary. A consultant has been working with area contractors to calculate the construction expense per square foot in 2018, when the work is anticipated to begin, Brownman noted. However, the estimates are “highly conceptual,” he emphasized. They are based on average numbers, he continued, and the expenses involved with planning, design and permitting, for example, will have to be added in to arrive at the preliminary budget figure. The information “is not enough fleshed out for us to be able to say” what voters will see as the final number, he added. The first project on the list, Brownman explained, is the creation of the Public Safety Campus on the county-owned Cattlemen Road site where the new Emergency Operations Center exists. A slide staff prepared for the presentation showed the cost estimate for that project at $105.9 million, which includes a 10-percent planning contingency. Brownman pointed out that, as a result of the joint meeting on Oct. 29 of the Sarasota and Manatee county commissions, the proposal to combine the 12th Judicial Circuit Medical Examiner’s Office with the Sheriff’s Office’s Forensics Lab in one building has been eliminated from the site plan. As a result, the Forensics Lab will be made part of the new structure housing the sheriff’s administrative offices, Brownman added. Therefore, savings can be realized in keeping the Sarasota County History Center in its current location, he said. 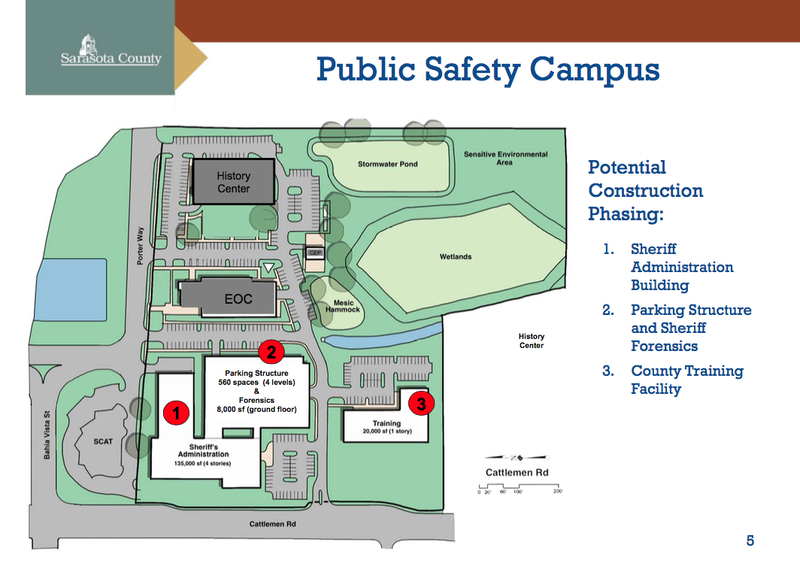 The previous campus plan called for that building’s relocation to make room for the Medical Examiner’s Office and Forensics Lab structure. The second project is the expansion of the R.L. Anderson Court Facility in Venice, including six new courtrooms (two large ones, two of medium size and two small ones). The preliminary estimate for that work, with a 10-percent contingency, is $36.4 million, another slide indicated. Brownman noted that secure internal connections would be created to the existing facilities in the Anderson complex, including those of the county’s constitutional officers. 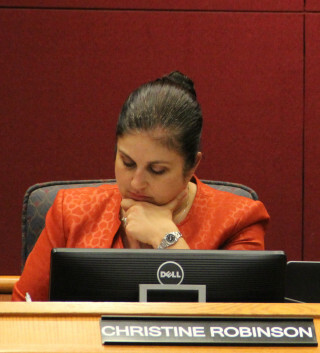 “I know it may sound like semantics to you,” Robinson responded, but she saw the situation differently. “It’s not a matter of convenience. It’s actually a matter of access,” she told Brownman. “Thank you for that clarification,” he replied. When Robinson asked later whether the planned security measures would apply to the existing facilities for the State Attorney’s Office, Brownman told her they would. Robinson pointed out the ease with which people can look into those offices, characterizing the situation as the attorneys essentially being “sitting ducks” at their desks. Further, she told Brownman, “I can’t tell you how many domestic incidents happen” near those offices, also potentially exposing the attorneys to harm. Robinson served in the State Attorney’s Office prior to her 2011 appointment to the County Commission. Finally, Brownman pointed out, a new site for the Sheriff’s Office fleet maintenance facility is a priority. However, even though county staff would like to combine that complex with a county fleet maintenance facility, Brownman continued, the problem has been finding a site large enough to accommodate both. “Our Real Estate Division has been looking all over the place for the appropriate size property” in the 24-acre to 25-acre range, he added, with zoning that would not portend problems for adjoining landowners. The estimate for the Sheriff’s Office facility on its own, with a 10-percent contingency, is $24.2 million, according to a staff slide; for a combined county/Sheriff’s Office complex, the preliminary figure with a 10-percent contingency is $48.4 million. 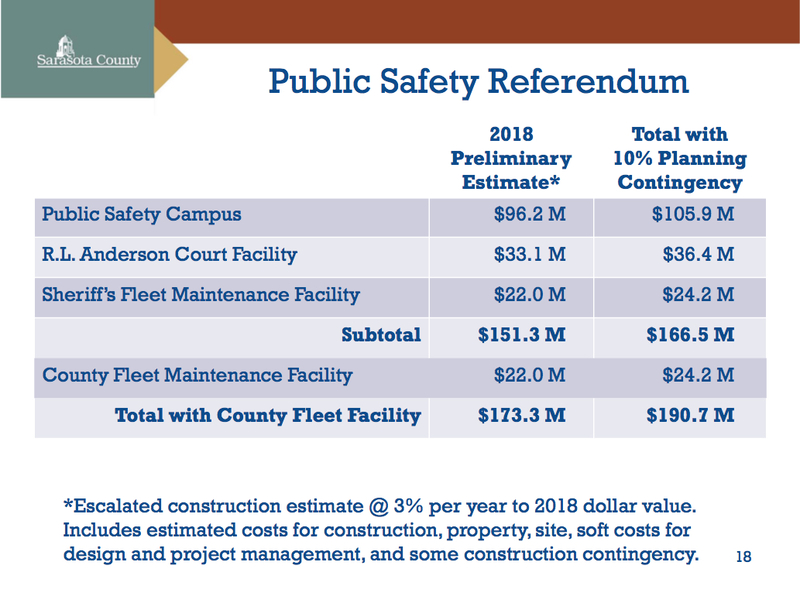 Altogether, the very early estimate for the total expenses with contingencies — including the combined Sheriff’s Office/county fleet maintenance facility — would be $190.7 million, a slide showed. 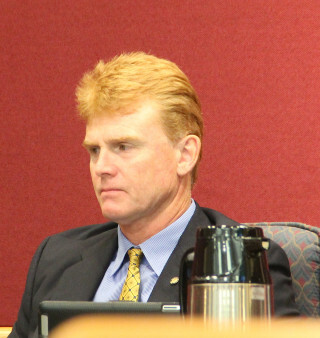 Because the county saved $500,000 each in expenses for two capital improvement projects that have been completed, Brownman added, staff has proposed using that $1 million to fund further analysis and hone the estimates for the 2016 referendum. At the conclusion of Brownman’s presentation, Commissioner Hines thanked him for the further refinement of estimates that have taken place over the past few months. Further, Hines extended his appreciation to Brownman and other staff members for their collaboration with representatives of the Sarasota County Bar Association and the Sheriff’s Office. Hines made the motion calling for staff to approve the preliminary list of facilities for the referendum. Commissioner Paul Caragiulo seconded the motion, which passed 4-0, in Mason’s absence. As a result of the board’s Nov. 9 vote, Brownman said staff will appear before the commission again on Nov. 17 to seek formal approval of a budget amendment so the $1 million left from the two capital improvement projects can fund staff’s continued refinement of the estimate for the November 2016 bond referendum.